There is a lot of interesting information here at this site about the Woods Mobilette, but for those Special Collectors that want to own a very early piece of American Automotive History, look closely, this one will be for sale soon. The Woods Mobilette automobiles were built in Harvey, Illinois between 1913 and 1917. The car was touted as “America’s First Cyclecar”, one of over 233 cyclecar companies which existed in North America for only a short period of time. Mr. Francis A. Woods first Mobilette prototype Model No. 1 was built by Mr. Woods in 1910. Sometime during 1911-1912 Mr. Woods built the Model No. 2, which was powered by a four cylinder 12 HP air cooled engine. Model No. 3 was Mr. Woods first production model with both staggered seat (Sociable) and Tandem seating roadster being powered by a 12 HP water cooled Woods Mobilette engine. The Mobilette engines were foundered by several foundries over the course of production. The Model No’s. 4 – 4A’s consisted mostly of specialty small trucks both pickup and panel truck types. The Model No. 5 went into production in 1916 with the 1917 Model 5A’s to follow. These 5A’s were the last models of the Woods Mobilette vehicles and the most expensive models. One 1917 Woods Mobilette Model No. 5A staggered seat (Sociable) roadster is known to still exist and is on display at the Henry Ford Museum in Detroit. Being a Model No. 5A, those Woods Mobilettes are powered by a 22 HP water-cooled four cylinder Perkins engine with a 3 speed floor shifted transmission mounted to the rear of the engine. These 5A models were unlike all previous Woods Mobilette production models which had a 2 speed real axle as their transmission. 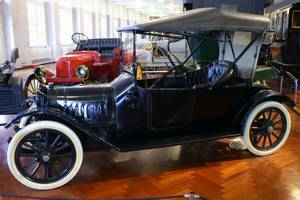 The 1917 5A Woods Mobilette roadster at the Henry Ford Museum carries serial number 2444. Since W. M. Sheridan, an investment banker from Chicago, had supported Francis A. Woods in his business venture; the most expensive Woods Mobilette at $540.00 was designated “Sheridan Light Delivery”. This model was also powered by the 22 HP Perkins engine cast under license by Massnick and Phipps a foundry in Detroit Michigan. Two of these 1917 Woods Mobilette Sheridan Light Delivery trucks are known to exist. One was featured in Automobile Quarterly’s first quarter issue in 2005, authored by the late Beverly Rae Kime, arguably the overall foremost expert in antique automobiles and world renown automobile historian and author of countless articles and volumes. The second is the Sheridan Light Delivery featured here. This vehicle, previously owned by the late William R. Kahl of Reiserstown, MD, was attained in 1998 with the restoration then taking over ten years to complete. Restoration was completed in December of 2008.